Sri Lankan premium tea brand teakruthi which was initially launched in 2017 in international markets in the US, UK and Canada, recently began selling in the local market via its website, www.teakruthi.com. Having proven its value proposition of all natural, single origin Ceylon tea in the international arena and delivered over 30,000 cups during the first two years of operations, teakruthi is now in Sri Lanka. “It is truly a great, mild tea – so glad to have great loose tea that is fresh! And, it is true what they say: I use the tea ball several times before discarding the tea leaves,” commented Nancy Moorman from Tennessee, USA who rates the brand 5 out of 5. Hoping to inspire a healthier lifestyle through the perfect cup of tea, teakruthi is committed to keeping its tea pure without blending in lower grade leaves. teakruthi buys tea direct from plantations, hence enabling them to deliver to customers’ homes anywhere in the world in less than 12 short weeks from plucking, compared to much longer lead times with most other traditional mass-market brands. By eliminating intermediaries such as re-exporters and bulk storage warehouses, teakruthi is able to deliver a fresher cup of tea to its consumers. Keeping its commitment to deliver the best cup of tea, teakruthi only offers the highest grade Pure Ceylon tea leaves without blending with lower grades and employs just-in-time small batch sourcing model to ensure stocks don’t degrade in warehouse facilities. The convenience offered by ordering online, and the resulting fast delivery, allows teakruthi’s customers in particular to experience unique and diverse varieties of fresh premium tea. teakruthi, derived from the Sanskrit word for work ‘sanskruthi’, aims to inspire a healthier lifestyle and bring back appreciation of tea — while we’re wired to be on the go in today’s coffee fuelled world, tea is about enjoyment with family and community. A venture initiated by Sri Lankans Sanjaya Herath, Dilan Fernando and Lasith Lansakara, teakruthi is a part of UniWorld Teas (a leading exporter and a private label packer that is ranked amongst the top five tea exporters on the Island), primarily concentrating in selling tea to consumers in USA, UK and Canada. They began offering a range of teas, encompassing Black, Green, White, Flavoured and Organic, to Sri Lankan consumers, with the promise of quick, Island-wide delivery ensuring that local customers can also enjoy the best high quality pure Ceylon tea. The team jointly brings many valuable years of tea trading experience to the business thus enabling innovation and variety. Sanjaya and Dilan are a part of the UniWorld Teas management team. While successful as leading tea exporters in the country, Sanjaya and Dilan, along with Lasith hatched the idea to launch an iconic and premium Sri Lankan brand — teakruthi. Dilan and Sanjaya leveraged their vast experience and expertise in the global tea sector to select some of the best teas Sri Lanka has to offer and handcrafted teakruthi’s offerings to encompass globally popular tea types. Lasith adds to the team’s expertise in digital operations and e-commerce through his experience as a management consultant at Deloitte. 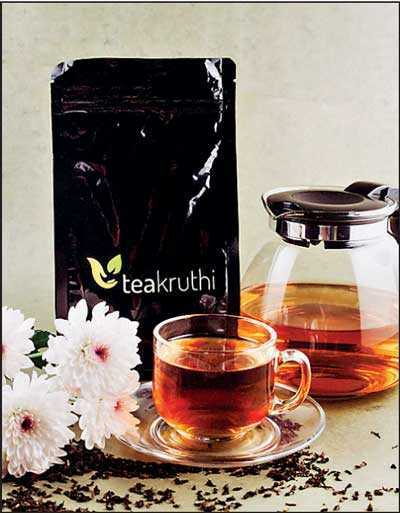 “teakruthi is a Sri Lankan tea brand offering premium, all-natural teas direct to online customers. We currently serve the US market primarily, accounting for about 80% of order volume, with the UK and Canada taking up most of the rest. However we do also have several orders coming from countries such as Saudia Arabia, Croatia, France, and Japan. Since our launch in 2017, we are excited to note that about 30% of our orders come from repeat customers compared to a 20% benchmark for most global online retailers. Of course the positive customer reviews are always reassuring,” commented Lasith, who handles brand marketing. Commenting further, Dilan revealed: “Being a private label packer of many large global brands, we see good tea being blended with medium and poor quality tea, in order to achieve commercial volumes and prices, which is why we decided to create teakruthi to offer exquisite tea to the tea connoisseurs the world over catering to their all-natural, clean palates, as well as to promote the numerous health benefits they provide. As lovers of a fine cup of freshly brewed tea ourselves, we expect our teas to be an adventure and a culture, transporting the consumer to the exotic location where it is grown, granting them a mini break from their daily routine.” Ethically and sustainably sourced, teakruthi only works with plantations that strictly adhere to standards of minimum wage and working conditions for their workers. Most of the plantations have these standards confirmed through third-party certifications such as the Ethical Tea Partnership, Rainforest Alliance, or UTZ. Additionally, to ensure that workers are sustainably provided for, teakruthi donates a portion of its proceeds to support the education of the children of plantation workers in Sri Lanka.